My first tourist excursion was to the Korean Demilitarised Zone (DMZ) on the border with North Korea. You can only visit in a tour group and normally have to give a few days’ notice. We were quite late applying but still just about managed to get on a basic tour. Look at the different options too – on ours there was a morning and full day tour but the full day only meant lunch and then a visit to the market. You didn’t actually get more time at the DMZ and yet paid 20,000 won more. We opted for the morning (8am – 2.30pm) tour which was around 40,000 won (£26). Also ask about discount if there’s several of you booking the tour. It’s all a bit of a rush but it’s pretty interesting. The border is only about a 45 minute bus ride out of Seoul. After watching an American propaganda video about their commitment to reunification, we explored one of the secret tunnels dug by the North Koreans to try and and invade the South after the division, and then headed to the lookout point where you gaze across the plains of North Korea. It’s quite a strange feeling knowing how close you are. Part of me does really want to visit but I also think it would frustrate me a lot. 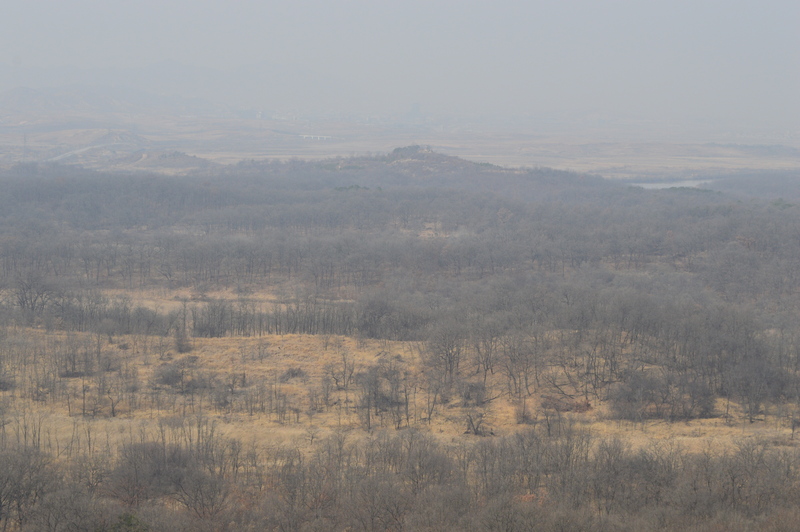 The view of North Korea from the DMZ. Another interesting part of the tour is being taken to Dorasan train station in the DMZ. Maybe it was just fascinating to me as a lover of trains but, not only does this station serve DMZ – Seoul, but it is also fully set up for trains to the North Korean capital Pyongyang. The track exists, the signs are all there and the tickets are ready to go. All it needs now is a train. It’s fully prepared for reunification as if, the second the border opens, everyone will flock to hop on a train to the other side. It’s a little eerie but does perhaps show a misguided loyalty towards reunification. Or perhaps it’s all just symbolic. 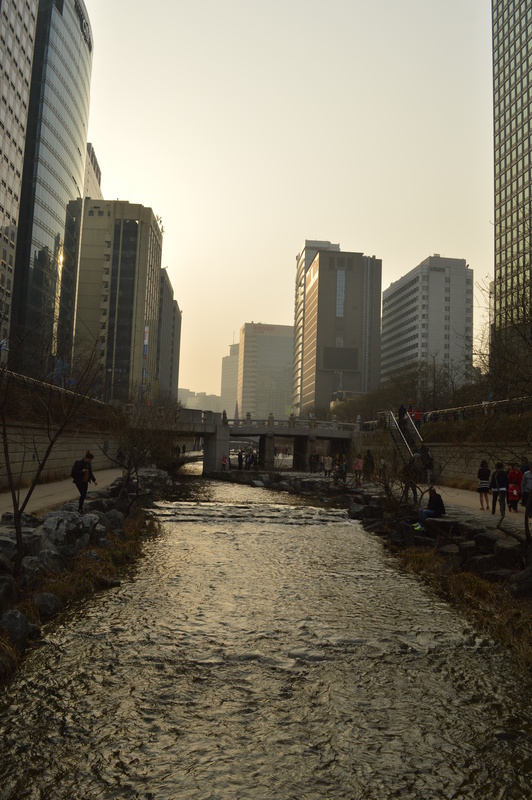 After a morning at the DMZ, we headed back to Seoul, grabbed some lunch and then wandered along Cheonggyecheon (try saying that when you’re drunk), a stream which runs through the city. In recent years, it’s been renovated into a huge urban park and made for a great stroll as the sun set. It’s close to loads of subway stations including City Hall (Line 1), Jogno 3-ga (Line 3) and Gwanghwamun (Line 5). I’d definitely advise going in the evening as the sunset was fantastic and it wasn’t too crowded, whilst still having a nice atmosphere. And, like the parks in Hong Kong, it had that ability to block out the bustle of the huge city, despite being slap bang in the middle of it.